With our solutions for the Screen Printing market, we are able to offer a wide range of applications for textile. Our comprehensive product range stands out for numerous excellent properties and satisfies with best printing characteristics and high fastness level. The water based screen printing pastes PRINTPERFEKT optimally serve the high and versatile demands of the fashion and retail industry. The wide spectrum of application techniques for T-shirts printing varies from simple color or white prints to glossy and metallic effects up to crack and foams. COLORMATCH pigments are the ideal link for this. Moreover, CHT screen printing pastes comply with many RSLs and ecological guidelines of the various brands and ecological labels, e.g. several fulfil the strict ecological and toxicological criteria of the bluesign® system. Under the aspects of these special market and customer demands, our product range is continually being developed and optimised. Transparent PRINTPERFEKT pastes are used on light colored textiles. They have no opacity, but by adding COLORMATCH pigments, brilliant color prints with a super-soft handle and very good fastness level are achieved. PRINTPERFEKT 226 FF and PRINTPERFEKT BASE FF are mentioned here as examples. In order to accomplish brilliant color prints on dark substrates, "opaque" pastes are used. These soft and elastic LAC products are available as ready-to-use pastes such as PRINTPERFEKT LAC 77 or PRINTPERFEKT LAC FF. In addition, they can be produced individually by mixing e.g. PRINTPERFEKT WHITE 680 FF and PRINTPERFEKT CLEAR 680 FF. More brilliance and a softer handle can be achieved with the discharge pastes PRINTPERFEKT DC 8 and DC 8 WHITE. CHT white pastes can also be applied onto dark substrates as pre-print or sole white for achieving the demanded opacity on the textile. PRINTPERFEKT WHITE 680 FF or PRINTPERFEKT BLANC FF stands out as soft and elastic white paste with a high fastness level. The addition of COLORMATCH pigments gives when needed a pastel colored print. The many different basic pastes and the matched profiles of requirement meet many different demands. 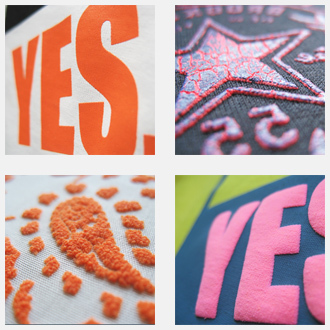 Aside from the basic print pastes, effect print pastes make modern screen printing varied and interesting. Our PRINTPERFEKT and TUBISCREEN pastes are fit perfectly for this segment as well. High-grade vintage and used effects can be achieved by using the products PRINTPERFEKT CRACK PRE in combination with PRINTPERFEKT CRACK BASE. Glamour is not neglected either. TUBISCREEN GD-SILVER, PRINTPERFEKT GD 270, TUBISCREEN GD-G or TUBIPERL SILVER give the special metallic and gloss highlights. If still that certain something is needed, a foam or foil effect can be achieved with PRINTPERFEKT EX FF or TRANSLAC BOND 55. All pastes can be varied individually with COLORMATCH pigments. For implementing your creations and ideas with our screen printing pastes, we are pleased to support you with our Technical Service at all times. Our impressive system solutions are mainly used for cuttings and T-shirt printing. 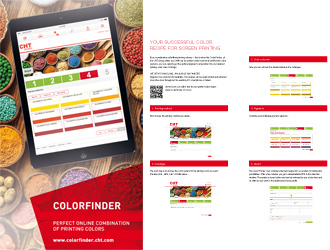 With this free of charge online tool you can flexibly and quickly calculate printing color recipes for Screen Printing which are based on the established color catalogues Pantone, HKS and RAL. In addition, recipes can also be created according to individual Lab* or RGB figures.